Even trivial Java apps are designed to run on multi-CPU machines with execution streams running in parallel. Each stream is called a thread. Each thread, by default, gets one megabyte of virtual RAM (Random Access Memory) reserved for its stack just in case it wants to grow. So 2000 threads would require 2 gig of virtual RAM, — which all by itself would fill the largest possible 32-bit virtual RAM space in a Wintel machine. You can configure this the stack space per thread on the java.exe command line with the -Xss 640000 option to configure a 640K stack. Threads may be implemented by the JVM (Java Virtual Machine) as native OS (Operating System) threads or alternatively as green threads. Microsoft’s term for green threads is fibers. Multiple green threads are simulated threads using one native thread. Green threads can’t take advantage of multiple CPU (Central Processing Unit) s, but they have the advantage of lighter weight for context switching and RAM usage. Natural Bridge used a hybrid of green and native which allows scalability to thousands of threads. An early Solaris Java had green threads. Pretty well the rest of thread implementations are native. You, as application programmer, have no way, in pure Java, to control which kind of threads are used. Threads that work in the background to support the runtime environment are called daemon threads. For example, the clock handler thread, the idle thread, the screen updater thread and the garbage collector thread are all daemon threads. The virtual machine exits whenever all non-daemon threads have completed. The daemon threads are then all automatically stopped when the JVM shuts down. The good news is, even though you are using Runnable, you don’t have the overhead of actually creating a new Thread since you are just calling the run method on the already existing Swing Thread. One of the most common errors is to tie up the AWT/Swing event thread with some long running computation or even a sleep. Everything freezes up. The GUI can’t respond to mouse clicks and no repainting happens. You have to spin the time-consuming task off on its own thread or use a Timer. Time-consuming tasks should not be run on the EDT (Event Dispatch Thread) aka Swing thread. Otherwise the application becomes unresponsive. The EDT is busy executing your task and hence can’t process GUI events. Swing components should be accessed on the EDT only. To access components from other threads, you must use SwingUtilities. invokeAndWait, SwingUtilities. invokeLater or SwingWorker. In general, multi-thread code is tricky, however, if you can arrange that threads don’t modify the same variables or look at variables other threads are modifying, just look at the same final variables, there is nothing to Threads. You don’t need any synchronization. Local variables are private to each thread so they are not a problem either. If you want a task to be run at some time in the future or repeatedly at regular intervals, you can schedule it with the java.util.Timer class. This is more efficient than spawning separate sleeping threads yourself. Timer uses one Thread to track the entire schedule. Where practical, use existing thread-safe objects, like AtomicLong, to manage your class’s state. It is simpler to reason about the possible states and state transitions for existing thread-safe objects that it is for arbitrary state variables and his makes it easier to maintain and verify thread safety. With the following basic tools you can craft all manner of complex interactions. // in parallel to this thread on a new thread. // t.run() would just call run in the ordinary way. Don’t forget to set your thread variable (t in the example above) to null when you no longer need it. You don’t have to wait till the thread terminates. If you don’t, you will end up with a useless dead Thread object cluttering your heap. There is another technique where you extend the Thread class and override its run method, but it is not as flexible. ThreadLocal is a technique of providing per-thread variables that without having to build them into the Thread object. Roughly speaking it makes a static variable into an automatically managed array, one slot per each active thread. was not originally part of JDK (Java Development Kit). You had to it separately. It lets you convert some long-running event handling code into a separate thread with just a line of extra code. You can put the current Thread to sleep for a period of time. It will awake prematurely if some other thread does a thread.interrupt() to it. It that case it will wake with an exception rather than naturally. Java priorities are in the range Thread.MIN_PRIORITY ( 1 ) to Thread.MAX_PRIORITY ( 10 ). The bigger the number, the better the access to the CPU a thread has. // one notch above the usual. // where it is now. Threads of equal priority are not necessarily scheduled round-robin style. One Thread can hog the CPU indefinitely squeezing out all the other Threads of equal priority even if the Threads call yield every once in a while to give the other Threads of equal priority a kick at the cat. You may starve Swing so it never gets a chance to paint anything, even if you are on a separate Thread. If you want to wait for another thread to die, you can put yourself to sleep until it does by issuing a join. It comes in two flavours with and without a timeout. The name may sound odd for a deathwatch function. Here are two ways you can think about it to remember it. I will join you again after death, even though we part our ways for now. Alternatively, there are two threads and then there is only one after the join completes. You can think of join as somehow that it merged/joined the two threads into one. Don’t try to join the current thread. Likely this is just quirky ancient Unix terminology living on. Getting a Thread to stop and waiting for it to die are slightly tricky. I have written a class called com.mindprod.common18.StoppableThread (download) you can use. It comes with source for you to create variants. It is well-commented to help you figure out how it works. The lock part of every Object is called the monitor. Note that the exact same critical code section may be executing simultaneously so long as it locks on different objects. You don’t always lock on this. Because synchronized blocks can be nested, it is possible for thread to lock multiple objects at once. Then you have the potential for deadlock. If thread a has object 1 locked and wants object 2 and thread b has object 2 locked and wants object 1, they will stare at each other, waiting indefinitely in a Mexican standoff, sometimes called a deadly embrace. One way to avoid this is to always lock your objects is the same canonical order, always 1 before 2 using some convention you concoct to determine the standard order. If you wanted two different critical sections to be able to execute simultaneously on the same object, to maximise speed in a multi-CPU machine or in critical sections that do i/o, you would need to create an auxiliary dummy locking object appended to (referenced by) the main object for the second critical region to use for its synchronized lock object, typically of type Object. Once you understand these basics, you can go on to more complex tasks like co-operating producer-consumer threads that wait on each other and ways of allowing simultaneous read of a structure but only single-thread update. Further, any variables that more than one thread might be changing have to be marked volatile to warn other threads to always look for a fresh copy of the value rather than relying on a their own cached copy. You don’t use Thread methods to rendezvous, but rather methods of Object, such as wait, notify and notifyAll. The use of these tools in the subject of an entire book. Imagine a simulated barbershop where customers wait and when a barber is free, one of the waiting customers is notified. If there are plenty of free barbers, there is no waiting. Customers call wait() when all barbers are busy. And a barber who is free calls notify() to wake up one of the waiting customers. With wait, you first must gain a lock on an object with synchronized, then you check if you really need to wait. If you do, then you call Object.wait() on the lock object. This puts your Thread to sleep and releases the lock so that other threads might have it. Eventually some other thread awakens you from your slumber by calling Object.notify() or Object.notifyAll() on the lock object. You wake up then get in line waiting the reacquire the lock. When you finally do, you continue execution. In other words, you wait for some other thread to complete some work and notify you when it is done. The notifier thread needs to own the lock to be able to call notify and it must release the lock before any of the waiting threads will be able to resume. Most of the time in all this, the object is not kept locked. It is only locked for short periods to check if waiting is really necessary and do the wait or notify. You can think of volatile as a sort of streamlined form of sharing variables between threads that does not require locking or synchronizing in time. A thread never blocks to access a volatile variable, it just takes some extra time to access it. Note that synchronized locking is done on entire objects. Volatile applies to individual fields in those objects. You might say that synchronized in for updating related groups of fields, where volatile is for updating independent single fields. Particularly in a multi-CPU situation, you have a problem with caching. Each CPU keeps copies of variables in registers and in various hardware RAM caches. If another CPU changes a variable, it may automatically refresh the other CPU s' caches, but it certainly won’t automatically refresh any other CPU ’s registers. This means a CPU may be using a stale copy of a variable’s value and not know it. When you declare a variable volatile it warns the compiler to generate code to fetch the value freshly from RAM every time it is needed, even if it already has a copy it has not recently changed itself sitting in a register. Further, it warns the compiler to generate code to store the value into RAM every time it is changed so that other threads will immediately see the new value. The same problem happens with less frequency in a single CPU system since each thread has its own virtual set of registers. Despite what you may read elsewhere, volatile is not sufficient to make x++ into an atomic operation. Patricia Shanahan proved this experimentally. atomic means indivisible, not high-powered. Even with if x were declared Volatile, the thread will not necessarily get to complete the load, add, store in one operation without some other thread meddling with the x variable. I have heard conflicting stories on just how synchronized and volatile mesh. It is safe to use them together: a volatile reference in a synchronized block. Some say you can use synchronized without volatile, but not volatile without synchronized in at least one of the threads. Others say you can use volatile on its own as well. It seems to me, you would be safest to declare any variable examined by different threads as volatile whether you do all access inside synchronized or not. However, this is probably belt and suspenders and might generate unnecessarily slow code. If I were designing the system, volatile would only be needed when there is some unsynchronized access. Experiments are not enough. That determines behaviour with only one compiler-JVM combination. Someday I will wade through the specs to find out how these keywords are supposed to work. I presume when you enter a synchronized block the compiler freshly loads all values it needs and when you exit it makes sure all are stored so that other CPUs (Central Processing Units) can see the new value. While it is inside the block it need not treat all variables as automatically volatile, since no other critical code is running. If someone can confirm or refute this assumption, please let me know. Very simple one way communication, especially announcements e.g. that it is time to shut down operations. Building synchronization infrastructure, such as barriers. In any case this has to be done very carefully, with a large dose of suspicion. Writing test cases for multiprocessor systems. The rest of the time, use synchronized blocks and mutex-protected critical regions since they are easier to think about and get right. The problem is misuse of these features creates very subtle bugs that may not show up for days, or only when run on certain machines. You really do need a deep understanding of this, something I do not have yet. Unfortunately, trying to escape learning by being overly conservative also imparts a big speed penalty. Applets need special permission to change Thread priority, even downward. Thread.interrupt will also interrupt an I/O in progress, likely closing the channel, as well as wake a sleeping Thread. You are not allowed to call start on an already running Thread. In other words, you can’t spin off multiple threads from the same Thread object. The start is not quietly ignored; you will get a IllegalThreadStateException. After a Thread has stopped, e.g. return from run, you can’t start it up again with start. You need a fresh spanking new Thread object. You could get around this by putting a loop in your run method with a long sleep that you interrupt it from to restart it. You can reuse the object with the run method, but not the Thread object. You don’t need to hang onto a reference to the Thread object until it terminates in order to ensure the running Thread is not garbage collected. Nullify the reference as soon as you no longer need it. If you create a Thread and fail to start it, in JDKs (Java Development Kits) prior to 1.5, it will not be eligible for garbage collection, even if your app drops all references to it. It stays alive through a reference in the parent ThreadGroup. Threads are rather whacking huge things. When they are running, they need about a meg of additional stack space. Since Threads are implemented primarily as native methods, it is up to the JVM implementation just how much RAM they eat when they are not actively running. It is therefore wise to allocate them at the last possible moment and nullify the reference at the earliest possible moment to conserve RAM. suspend, resume and stop are all deprecated because they are too unpredictable. How then do you get a Thread to stop? I have written a class called com.mindprod.business.StoppableThread (download) that deals with the problem. Basically you have to asynchronously set a Boolean that the run method checks periodically to request it to exit. Don’t ever put the main AWT/Swing event processing thread to sleep. It can’t then respond to clicks or other events. To speed repaint, all you can do is finish your event processing as quickly as possible, perhaps spinning off the hard work to a new thread and return from your event handler as fast as possible, possibly using Oracle’s SwingWorker class. You can’t use a simple Boolean flag to communicate between threads because, in a multi-CPU situation, each CPU may have its own cached copy of the flag. The only time you are guaranteed the copies will be in sync is in a synchronised code region locked on the object containing the field and when the field itself in marked volatile. ThreadGroups were a bright idea on paper, but never worked out. Avoid them. 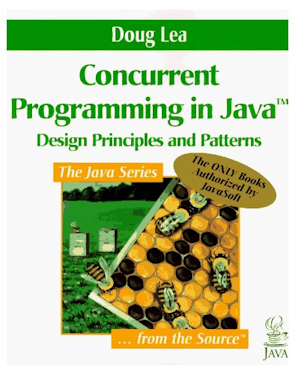 This is a gross oversimplification of what java.util.concurrent does, however, it might be a useful framework to use to dive in to the detail. You write little hunks of code conforming to an interface, then queue them up to be scheduled concurrently. There are three interfaces. Runnable with a run method. This is the simplest. Callable with a call method. This lets you return a single object. Future with its get method. It also has methods to poll the task to see how it is doing and to cancel it. Tying up the main event processing thread either by putting it to sleep or giving it some onerous task. You should do those things on some other thread or user a Timer. Poking a Swing widget’s methods with something other than the main event processing thread. Swing is not thread-safe. You must use SwingUtilities. invokeLater, or EventQueue. invokeLater for all your manipulations from some other thread. There are a few exceptions. So how do you catch yourself when you have accidentally made one of these two errors? If you have an Applet, convert it into a hybrid that can also be run as an application. For details how see Applet. When a GUI is running, most of the time it should be idle, just waiting for the next event. If you hit Ctrl-Break (Ctrl-\ in Linux?) in the console window, it will interrupt and tell you what all the threads were doing. If the event thread is busy running application code something is amiss. Also monitor some known well-behaved GUI apps so you get an idea the sort of behaviour you should find. You will be surprised just how many threads are in there. To catch yourself pestering Swing from the wrong thread try the ThreadCheckingRepaintManager. It checks that all repaint events came from the event thread. This won’t catch all your blunders, but it will catch most of them. If your threads do interact, writing bug free code is extremely difficult. Your code will work most of time and then unexpectedly freeze during the big demo. You have to write the code using pure logic and paranoia, not just trying things and testing. As much as possible, use packages to handle your thread interaction problems. The authors of these packages specialise in the arcane art. Further, there are thousands of eyes checking the package for flaws. Java version 1.5 or later has a rich set of thread handling classes, with even more goodies added in 1.6. You will want to write for Java version 1.6 or later for any multi-thread program. Wherever possible, use them in preference to your own code. Keep in mind that things that could only happen once in a billion times will happen twice a second in a computer. Let me repeat that for emphasis, the practical solution to bugs is to throw out as much of your home-brew Thread logic as possible and replace it with standard library code from the java.util.concurrent package. It is being exercised in thousands of other applications. There are thus thousands of eyes peeled for bugs besides yours. It was written by the world’s acknowledged best thread expert, Doug Lea. read online. 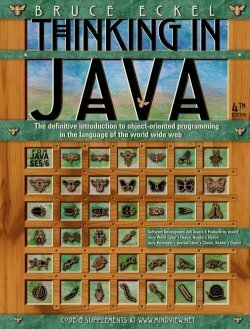 Good if you want to understand the philosophy behind Java. 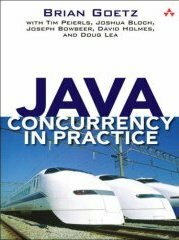 It does not cover Java 1.5 or later, e.g. enums, generics, for:each loops, annotations. An introductory book with good examples. Not as deep as you would usually expect from O’Reilly.